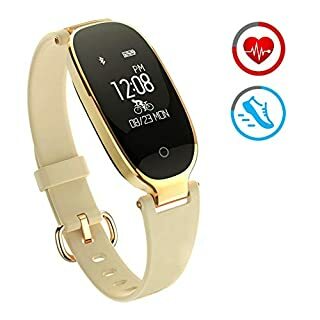 ZKCREATION smart watch open your heath and happy life Product Description Track Daily Activities, Set a Sport Goal Track steps taken, distance traveled, calories burned. You can also set an exercise goal in the app "I Fit" to keep health or lose weight. Achieve that goal step by step, you will step up to a higher fitness level if you finish that goal. Remind You to Move This smart bracelet will vibrate to remind you to move if you stay at your seat for a long time. Find Your Phone Quickly You are about to go out, but you can not find your cell phone! Do not worry! Simply long press the "Find Phone" icon on the screen. Your phone will vibrate or send out audible sound signal. ( Attention: please open the Find Phone function in the app.) Anti-lost Function When your smart phone is beyond the Bluetooth range (no more than 5m), the smart wristband will vibrate to alert. (Attention: please open the Anti-lost Alert function in the app) Heart Rate Monitor Support real-time monitoring of heart rate. Call Alert The tracker vibrates and the call is displayed on screen when there is an incoming call. Alarm Alert Set silent alarms on the tracker to wake you up without disturbing your family. SMS Alert Remind incoming text message on your tracker screen. Remote Camera Shooting Operation on the screen could remotely control photography shooting. 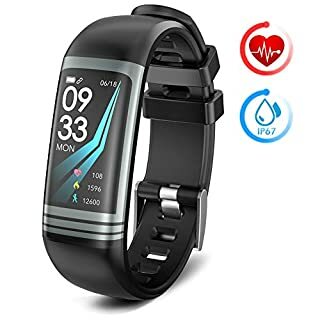 Package included Smart Fitness Bracelet( with heart rate function) x 1 User Manual x 1 USB Charging Cable x 1 Charge battery table x1 Warranty Every ZKCREATION smart watch includes a 45 days money back & 18-month worry-free guarantee. Specifications: SIM Card: Single SIM Card (Micro SIM Card) can be as a phone Frequency: GSM 850/900/1800/1900 MHz Bluetooth: Bluetooth 3.0 Storage: RAM 128M, ROM 64M; External memory: Support TF card up to 32GB Display: 1.56 inch TFT LCD, 240 x 240 pixels Camera: 2.0 M Languages: English, Italian, German, Dutch, Spanish, French, Polish, Turkish, Portuguese, Russian Functions: Bluetooth Dialer, Contacts, Call Reminder, Clock, Anti-loss, Pedometer, Sleep Monitor, Sedentary Reminder, Calendar Talk Time: 3 Hours; Standby Time: 180 Hours SMS: Support Gravity Sensor: Support USB Port: Mini USB 5pin interface Product weight: 75g; Appearance size: 43.5 x 40x 9.8mm Battery: 380mAh maximum capacity polymer battery Media: Music/video: Support Hand-writing: Support Picture Format: JPEG, GIF, BMP, PNG Music Format: MP3, WAV Package includes: ZKCreation Smart Watch * 1 USB Cable * 1 User's Manual * 1 Note: This watch is perfect on all Android smartphones, It can also work with iPhone as a Bluetooth device,But some functions like Notification Push, Remote capture, Anti-lost are currently unavailable Two Working Mode: 1. Bluetooth Mode: enable to make call or receive call or send or get message via Bluetooth 2. Network mode (SIM Card inserted): make call or receive call and send or get message via the SIM card you inserted which means at this time this watch works as a real phone, you can hang out without your smart phone The app to sync it is actually called BT Notifications; PLEASE FULL CHARGE BEFORE FIRST USE! ➤Note: For Android phones, all functions work. 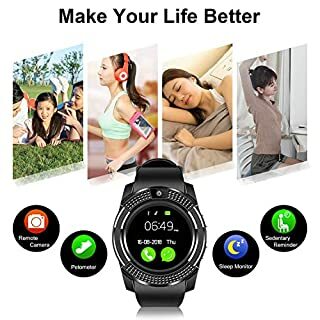 For iPhone,the smart watch only supports partial functions after connecting by Bluetooth, including Calling, Hands Free, Music Player, Camera, Sedentary Remind, Sleep Monitor, Pedometor, Calculator, Clock, Calender. For iPhone NOT SUPPORT BT Notifications, Sync Message, Remote Notifier, Send Message, Phone Book, Facebook, Twitter, Whatsapp. The APP is only for Android phone, not for iPhone. 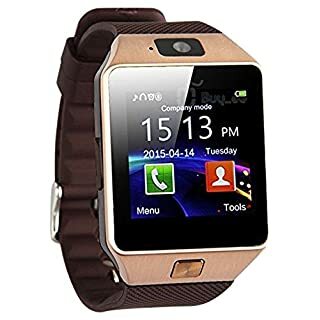 ➤Main Features: ● Calling: You can use this smart watch to call in 2 ways. The first way, you need to put a SIM card into the smart watch, then you can make / answer calls by the smart watch. it only supports 2G network GSM SIM card(GSM/GPRS 850/900/1800/1900 band). We recommend the Vodafone and EE SIM card. 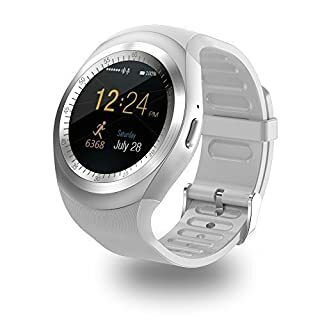 The Second way, you don't need to insert a SIM card to the smartwatch, but you need to connect the smart watch with your mobile phone by Bluetooth, then you can make / answer calls by the smart watch too. 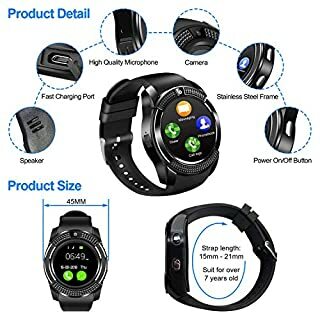 ● SMS: Send / Receive SMS messages(Need a SIM card); or sync SMS by Bluetooth ● Phone calls reminding: Ring and vibrate when there's a call ● Audio player: It can play MP3 music (need a TF memory card, maximum support 32GB) ● Camera: you can take pictures by the smart watch. ● Profiles: You can activate the "Silent" mode to make it quiet ● Two-way anti lost: Anti lost remind; Two ways search ● Pedometer: It counts your steps ● Sedentary remind ● Sleep monitoring ● Alarm: you can set 5 different alarms ● Bluetooth push: it syncs calls, messages, phone books, call history, notifications, times etc. 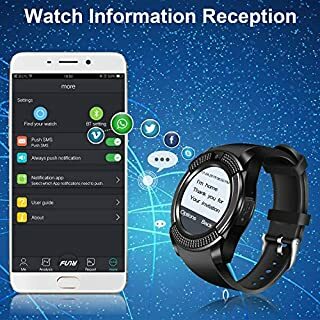 you need to connect the watch with your Android mobile phone first. 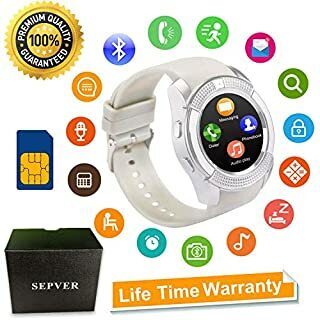 ➤What's in the Package : 1 x Smart Watch 1 X USB cable 1 x User Manual ➤After-Sales Service You can search SEPVER in Youtube, you can learn how to use the smart watch in the video. 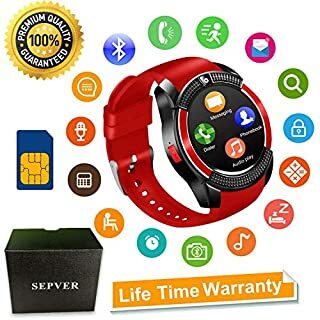 ➤Main Features: ● Calling: You can use this smart watch to call in 2 ways: The first way, you need to put a SIM card into the smart watch, then you can make / answer calls by the smart watch. it only supports 2G network GSM SIM card(GSM/GPRS 850/900/1800/1900 band). We recommend the Vodafone and EE SIM card. 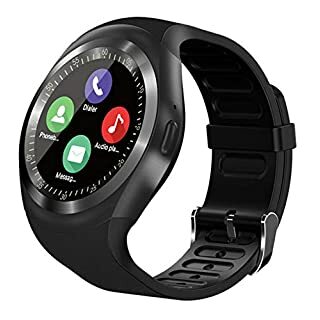 The Second way, you connect the smart watch with your mobile phone by Bluetooth, then you can make / answer calls by the smart watch, no need a SIM card in the watch. 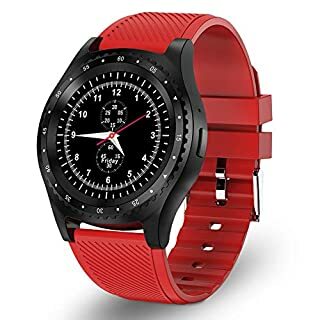 ● SMS: Send / Receive SMS messages(Need a SIM card); or sync SMS by Bluetooth ● Phone calls reminding: Ring and vibrate when there's a call ● Audio player: It can play MP3 music (need a TF memory card, maximum support 32GB) ● Camera: you can take pictures by the smart watch. ● Profiles: It has 5 profiles, you can activate the "Silent" mode to make it quiet. ● Two-way anti lost: Anti lost remind; Two ways search ● Pedometer: It counts your steps ● Sedentary remind ● Sleep monitoring ● Alarm: you can set 5 different alarms ● Bluetooth push: it syncs calls, messages, phone books, call history, notifications, times etc. you need to connect the watch with your Android mobile phone first. ➤What's in the Package : 1 x Smart Watch 1 x USB cable 1 x User Manual ➤After-Sales Service You can search SEPVER in Youtube, you can learn how to use the smart watch in the video. ➤Note: For Android phones, all functions work. 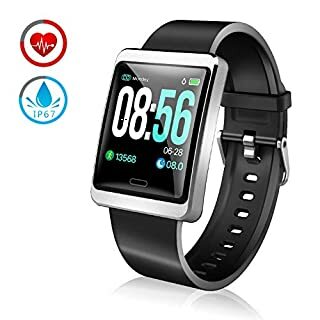 For iPhone,the smart watch only supports partial functions after connecting by Bluetooth, including Calling, Hands Free, Music Player, Camera, Sedentary Remind, Sleep Monitor, Pedometer, Calculator, Clock, Calendar. For iPhone NOT SUPPORT BT Notifications, Sync Message, Remote Notifier, Send Message, Phone Book, Facebook, Twitter, Whatsapp. The APP is only for Android phone, not for iPhone. 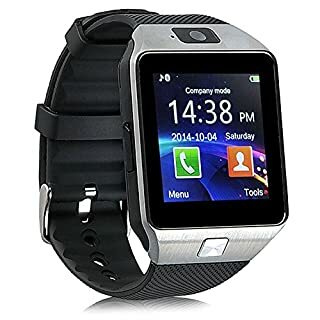 - Bluetooth Smart Watch with SIM card and SD card slot up to 32 GB. - can be matched to your mobile phone via Bluetooth and/or as GSM wrist. - and built-in camera microphone for calls and calls. Camera - 2.0 MP. 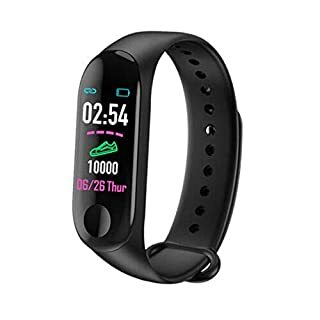 - Sport with monitoring for sport wrist (counts steps, stopwatch function and heart rate monitor). - Compatibility with iPhone, Samsung, Nokia, HTC, Android and devices with Bluetooth. 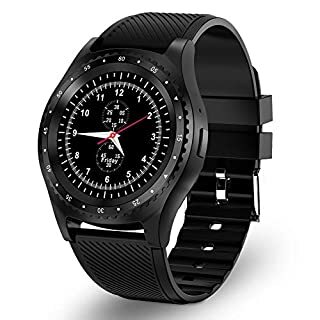 ➤Main Features: ● Calling: You can use this smart watch to call in 2 ways: The first way, you need to put a SIM card into the smart watch, then you can make / answer calls by the smart watch. it only supports 2G network GSM SIM card(GSM/GPRS 850/900/1800/1900 band). We recommend the Vodafone and EE SIM card. 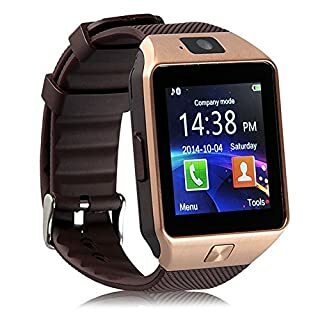 The Second way, you connect the smart watch with your mobile phone by Bluetooth, then you can make / answer calls by the smart watch, no need a SIM card in the watch. 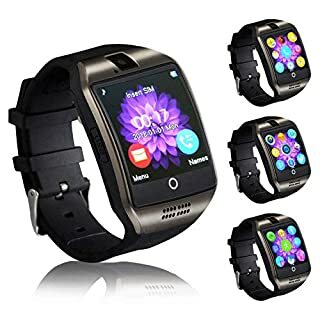 ● SMS: Send / Receive SMS messages(Need a SIM card); or sync SMS by Bluetooth ● Phone calls reminding: Ring and vibrate when there's a call ● Audio player: It can play MP3 music (need a TF memory card, maximum support 32GB) ● Camera: you can take pictures by the smart watch. ● Profiles: It has 5 profiles, you can activate the "Silent" mode to make it quiet. ● Two-way anti lost: Anti lost remind; Two ways search ● Pedometer: It counts your steps ● Sedentary remind ● Sleep monitoring ● Alarm: you can set 5 different alarms ● Bluetooth push: it syncs calls, messages, phone books, call history, notifications, times etc. 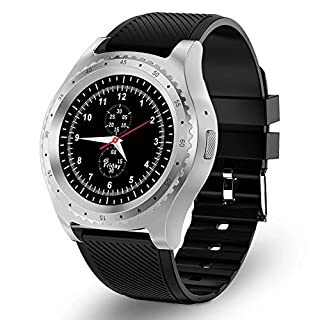 you need to connect the watch with your Android mobile phone first. ➤What's in the Package : 1 x Smart Watch 1 x USB cable 1 x User Manual➤Note: For Android phones, all functions work. 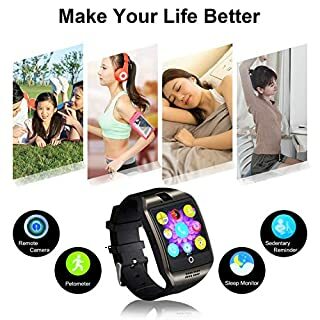 For iPhone,the smart watch only supports partial functions after connecting by Bluetooth, including Calling, Hands Free, Music Player, Camera, Sedentary Remind, Sleep Monitor, Pedometer, Calculator, Clock, Calendar. For iPhone NOT SUPPORT BT Notifications, Sync Message, Remote Notifier, Send Message, Phone Book, Facebook, Twitter, Whatsapp. The APP is only for Android phone, not for iPhone.